Really pleased with this menu. First dinners of the season! Individual pastry cases filled with Sweetcorn and tart mix. Served with Sweetcorn Purée, Roasted Apple, Lamb’s Tongue Lettuce and Apple and Walnut Dressing. It sounds so simple and yet looked and tasted brilliant. Beautiful Rack of Lamb. Season, render the fat in the pan, brown on all sides, butter and baste. Finish in the oven. 8-9 minutes. Leave to rest. Served with Parmesan Mashed Potato (trimmings from turning the Fondant Potatoes), Fondant Potatoes, Roast Onion Purée and Cauliflower. Green vegetable might have been better for colour. Sauce with very simple and very effective. Added too much Red Wine Vinegar initially. Had to dilute and balance with Redcurrant Jelly. Powerful sauce so only served a little. Pprepared the Cider and Sugar syrup. Peeled and cut the pairs into 8. Poached in the syrup. Removed and reduced the poaching liquor. Seasoned Berries with Castor Sugar and allow to macerate in the juice. Make the Meringues and cook in the oven. Made Chantilly Cream and Raspberry Coulis. Added the Chantilly Cream to the plate, followed by the Pears. Spooned the Berries in the gaps and drizzled with Cider Syrup over the Pears. Mixed the juice from the Berries with the remainder of the Cream. 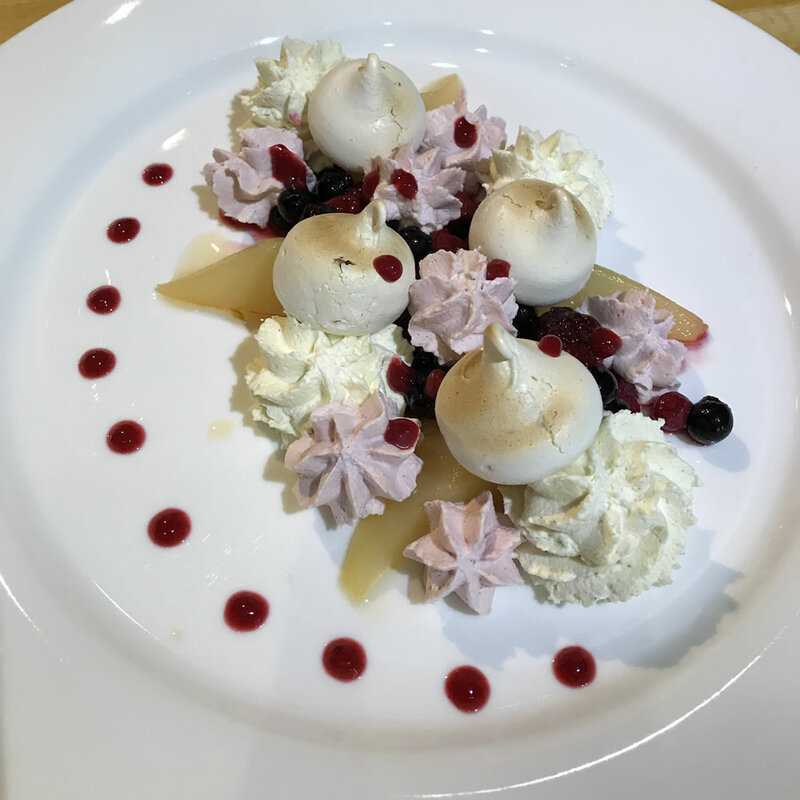 Added the Meringues to the plate and piped with Berry Cream in and around the plate. Added some Raspberry Coulis and served.